Stacie Harvey, Senior Travel Consultant at our Bury St Edmunds travel agents, took her first river cruise with AmaWaterways. Here is how she found her short trip from Amsterdam to Cologne. My outbound flight was flying from London Stansted with Easyjet and everything was as you would expect for a low-cost flight. There was a slight delay caused by Amsterdam Air Traffic, but all in all, it was a good flight. Stansted has improved greatly from my last trip. We experienced a smooth check in/bag drop, security was swift, helped by their recent improvements and the airside terminal has completely changed into a shopper’s paradise. Our inbound flight from Cologne to Stansted was with Eurowings/Germanwings and the airport experience was much the same, with a smooth check-in and drop off. The service on board was ok; they included a small snack and drink as standard. AmaPrima is a beautiful ship, offering a great choice of cabin types along with expansive public spaces. We were very lucky to have an AB grade cabin which is one of the cruise line’s twin balcony options. This means that there is a full outside area as well as a Juliette balcony. The cabin had lots of natural light and the ability to open it up to include the outside space. It was a nice size, though beds are on the small side. This was not a problem for me though with my height. There’s the option to have the bed set up as a twin or double and there’s a good size en-suite. Wi-Fi was complimentary throughout the ship, along with Apple Macs in each cabin offering great on-demand services. The ship had one good-sized lounge with a bar, providing ample seating areas to sit back and relax, with floor to ceiling windows to gaze out of. Here they would hold captain’s parties and low-key evening entertainment, along with their own pianist who pops up next to his piano at different times of the day. You can also get 24-hour coffee & teas within the lounge. The sun-deck had great 360 degree views, with a small, heated swimming pool and swim-up bar. There were ample sun loungers, tables & chairs and an optional shaded area if needed – a great place to sit back, relax and take in the passing scenery. Dining on board is all open-seating with set times for dinner. AmaPrima has one main restaurant offering tables and booths with lots of light coming in through the numerous windows. The optional chef’s table restaurant features a tasting menu and you can sit and watch the chefs in action. This is reservation only and spaces are limited, so you would need to pre-book as soon as you’re on board. Breakfast was a self-service buffet with optional table ordered items such as poached egg etc. The buffet had everything you would want from a tasty breakfast. Lunch was, again, self-service for starters and dessert with chef choices for main course in the main dining room. If you wanted a light lunch, you could head up to the lounge for a small selection of snacks. 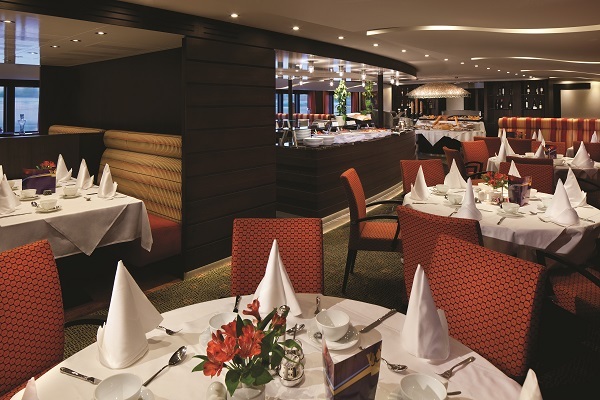 Dinner is a multi-course affair with some chef’s recommendations relating to the destinations that you are cruising through, along with optional classic dishes like steak etc. There was always something for everyone and dietary needs are well taken care of. Other items included are on board are wine, beer & soft drinks with lunch & dinner. Bar prices are reasonable and seemed very much like pub prices you would find at home. Entertainment is very low key. Every couple of nights, certain acts are brought on board depending on the area sailed. This would all be finished by 10pm at the latest. 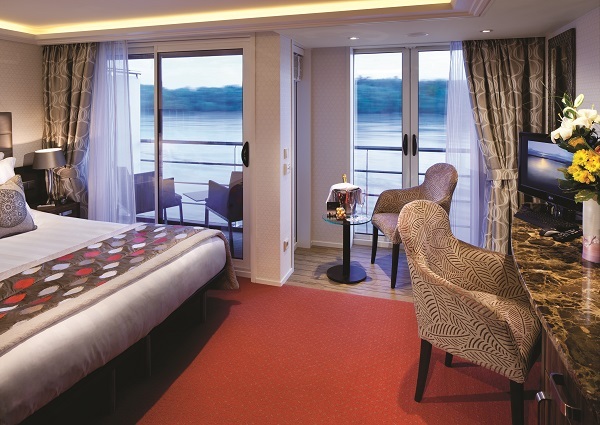 AmaWaterways includes an excursion in each port or you can head out on your own if you prefer. There is also the option to book extra tours and pay for the, whilst on board. Due to our limited time on board, the only port we could take advantage of was the free excursion in Amsterdam. This was a great, leisurely three-hour trip offering a city tour, canal cruise and panoramic sights taking in the rural countryside and famous windmills. The staff were very friendly and made us feel relaxed and at home; you never felt rushed through dinner and the staff had lots of time to interact with all the guests. I loved the whole concept of a river cruise which offers a relaxed way to see the historic sights that line the world’s greatest rivers. Cabin size was good and larger than I expected. I would say a balcony is a must to make the most of your time on board. It’s really special to sit out on your balcony watch the world go by and there’s always something to look at. Even though the food was nice in the main dining room, after a few days you would probably want something lighter. The choice in the lounge was very limited and you may find yourself having to head back the main restaurant. This would be a great option for anybody wanting to experience a good standard of river cruise with a relaxed pace. The cabins are lovely, with a great home-from-home feel throughout the ship. This would not be best-suited for clients wanting more from their evening entertainment as it was very low key. Night owls would probably want something more unless you travelled with a group. One main note from the trip is to consider your mobility needs. If anyone does have limited mobility and is unable to climb steps, walk gangways etc., it would not be well-suited. The main reason for this is that sometimes you will dock next to other ships and have to pass up and over them to reach the shore. Within the ship itself, the lift only goes to certain cabin decks and not up to the sun deck. This was my first experience of a river cruise and I very much enjoyed the whole ethos of it. It would appeal to all types of travellers and I can’t wait to go again. Thank you very much! If you would like to take a European river cruise like the one that Stacie enjoyed, our friendly team will be more than happy to help you find the perfect itinerary. Visit our travel agents in Essex, Suffolk, Norfolk or along the south coast.